Yet as of Tuesday, “Moonlight” has made $28.6 million at the international box office — more than its $27.5 million domestic take — for a worldwide total of $56.1 million. With the film still in theaters, even more is expected. “This black film is definitely selling overseas,” Jenkins said to The Times on the red carpet for the Screen Actors Guild Awards, just after he’d returned from Europe. It’s one more way “Moonlight” has bucked conventional wisdom. For 1995’s “Bad Boys” and its 2003 sequel — which together pulled in a combined $210.3 million internationally and $414.7 million worldwide — it was the fact that the film was an action flick, never mind leads Smith, Martin Lawrence and Gabrielle Union. For 2015’s “Straight Outta Compton,” a $40.4 million payoff internationally (and $201.6 million worldwide), it was the popular music of rap group N.W.A. The latest picture to face the international test head-on is “Get Out,” from writer-director Jordan Peele. While the social thriller starring Daniel Kaluuya has been the talk of Hollywood since its Feb. 24 premiere — making its auteur the first black director with a $100 million debut — the film is just beginning to be released internationally, an effort by the studio to first test the film among its intended American audience and then strategically roll it out in other countries. Such an approach capitalizes on the film’s current hold in American pop culture while forecasting potential territories it might play well in. For Peele, the myth doesn’t negatively affect “Get Out’s” worldwide appeal. 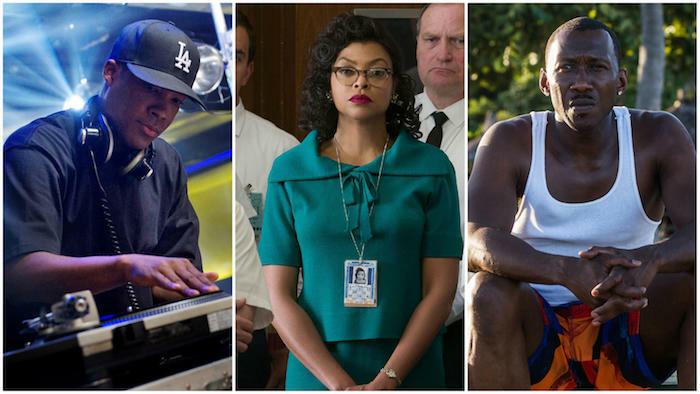 Director and producer Reginald Hudlin says, “The confusion starts with the definition of ‘black film,’ as if it was a genre. There are musicals, action movies, comedies, horror films, but ‘black’ is not a storytelling genre. And the fact that these movies [with black casts] that can be wildly different are all put in the same category as if they’re all the same, ignoring actual genres, which can have a huge effect on its ability to travel, already leads to people misunderstanding its worldwide box office potential. For an American independent film to make it into an international theater, a producer works with international sales agents to license the rights to overseas distributors. The licensing process often begins with the sales agent attempting to pre-sell the film, persuading local distributors in international markets to purchase rights before the movie is fully completed. While some films get purchased during the pre-sale process, international buyers can also choose to wait until they see a finished film, either at film festivals, at film markets, such as Santa Monica’s American Film Market, or those held alongside the Berlin and Cannes film festivals. A film’s commercial potential, which takes into account the U.S. release date, script, director, genre, cast, critical acclaim (if it’s been shown) and culture of a film, dictates the enthusiasm of international distributors. At last year’s American Film Market, “Moonlight,” says Voltage Pictures’ Deckter, was “one of the most sought-after movies,” months before it landed any awards-season nominations. The reason for such high interest in the film, independently made through Brad Pitt’s Plan B and A24, wasn’t obvious. Perhaps with the success of “Moonlight,” some of those entry points are now more clear. To Clanagan of Lionsgate’s Codeblack Films however, the fault for the pervasive myth lies at the feet of international distributors themselves. When Deckter was president of IM Global, he sold “Lee Daniels’ The Butler” and Marlon Wayans’ “A Haunted House” to international distributors. “A Haunted House,” a comedy starring Wayans and Essence Atkins, brought in $20 million internationally — on a $2.5 million budget. “Lee Daniels’ The Butler” pulled in $60 million internationally, “twice as much as we thought,” he says. There are general ideas about what types of films do better in certain countries, though there are exceptions to every rule. Dramas, for example, don’t play as well in Germany as they do in Britain. Comedies, unless they have huge stars, don’t play as well in France, Italy, Germany and Spain. It’s also difficult to translate comedy in hopes of connecting with an international audience, unless it’s slapstick in nature like the “Ride Along” or “Big Momma’s House” franchises. “When people talk about ‘black films,’ the idea that quality is a factor [for the audience] is usually not considered,” says director and producer Hudlin, noting that many believed “Django Unchained,” the 2012 slavery western starring Jamie Foxx, wouldn’t travel. The Quentin Tarantino-directed picture brought in $425.4 million worldwide, with $262.6 million at the international box office, nearly $100 million more than its $162.8 million in domestic ticket sales. “It’s not giving the same allowances to audiences [of films with black casts] that we do for other films,” Hudlin says. Such stigmatization shows up in the marketing schemes of films with diverse casts where U.S. posters of films are recast for some countries. 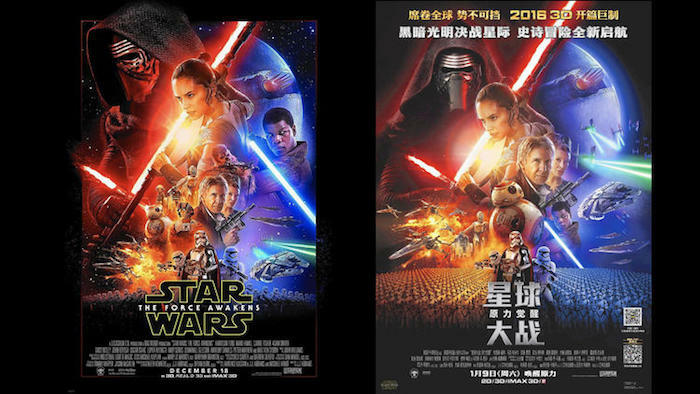 Chinese posters for “Star Wars: The Force Awakens” shrunk the face of John Boyega, the black actor who played Finn, one of the film’s lead characters. 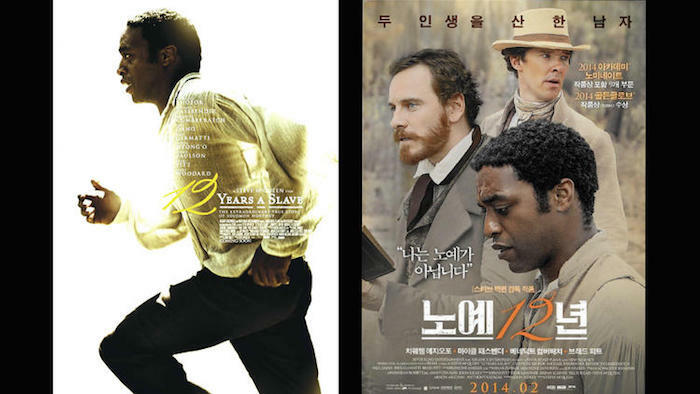 In 2013, Italian marketers prominently displayed Brad Pitt on a poster for “12 Years a Slave.” Pitt had a cameo in the movie but his dominance on the poster overshadowed Chiwetel Ejiofor, the black star. .In a possible sign of progress, word is that the international posters for “Get Out” will feature Kaluuya, not his white co-star Allison Williams. The next black film that Deckter and Voltage Pictures is shopping to international buyers is “All Eyez on Me,” the Tupac Shakur biopic set for a U.S. release June 16. Voltage made the deal to handle foreign distribution of the film in October, a comfortable gamble only because a similar film became a blockbuster years earlier. Surely 2004’s “Ray,” starring Foxx as the internationally known singer Ray Charles, which pulled in almost $50 million internationally, should’ve been a proof of concept too. Hudlin admits that after more than 20 years of pitching movies with multiethnic and black casts to studios, he no longer has to preface it by saying “films with black casts aren’t just for black audiences.” But there still is a hesitancy to greenlight such films.